If asked about the fastest animal on land everyone would know that the Cheetah is the Usain Bolt of land animals. They can sprint at an incredible speed of 110 (even up to 120) kilometers per hour. 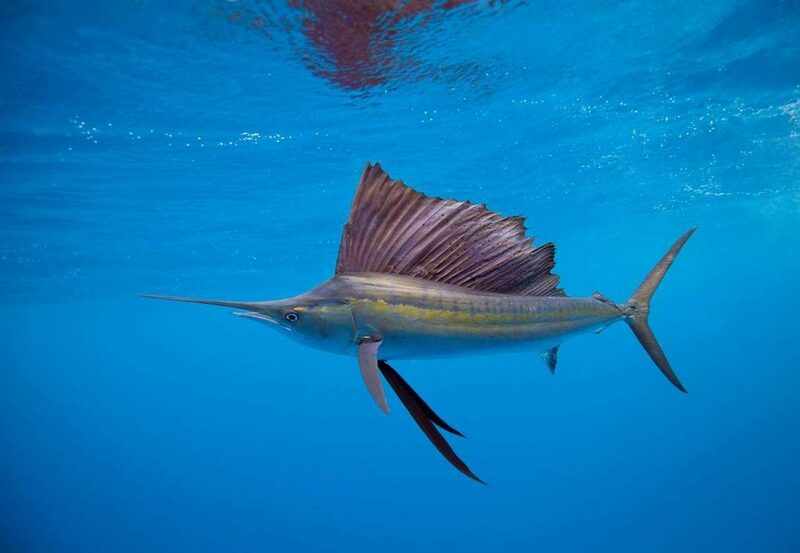 But did you know that Sailfish can also travel for short bursts at 110 kilometers per hour? You truly do not want to be in front of one while it’s running late to work. Sailfish are widely known for it’s beautiful dorsal fin that resembles a sail. The height of their dorsal fin could easily match the entire length of their body. They are found in warmer waters of the Atlantic and Pacific oceans and despite their ability to plunge into deeper waters, they are mainly found at 10 to 20 meters. They have an average lifespan of 4 years and one of the most fascinating findings about Sailfish is that once the female lays her eggs they hatch an unbelievable 36 hours later! And that’s not all for these super babies, once hatched they can grow to almost 6 feet within the very first year. The record is held by a Sailfish caught in 1994 that was over 10 feet long. If you want to get on that sailfish diet just go ahead and add flying fish, squid, octopus, anchovies, tuna and mackerel to your meal times. They have even been reported to put in a team effort to catch prey by using their dorsal fins to trap prey in a “cage” and they are also known to use their long sharp bills to skewer their prey. Although they are mainly dark blue with a silvery underbelly they change colour according to mood and can even flash dazzling colours when excited. Their speed is mainly attributed to their bill and streamlined body, which has been shown to cause what’s called low resistance flow, or in other words, good hydro-dynamics. Coupled with a strong backbone and a sturdy crescent-shaped tail even the fastest human swimmer falls short at a measly 8.6 kilometers per hour against the Sailfish. An amazing fish all round capable of both speeds and height that I have unfortunately not been able to achieve. You win this time Sailfish.